Most major cities throughout the UK suffer from the same issues these include poor housing, high levels of unemployment and high levels of dependency of state benefit this all creates an atmosphere where the city centre is targeted as a place to commit acquisitive crime. This coupled with general anti-social behaviour , street drinking, shop theft and rowdy behaviour due to excess alcohol consumption. Having a Street Marshal , Police, and CCTV combination violent crime is down. To Deploy high visibility SIA registered security personnel, briefed by the Police, to patrol the city centre of any major city for the purpose of increasing public reassurance and where possible diffusing low level alcohol related crime and disorder to prevent its escalation into more serious incidents. The Street Marshals are also trained in drug and alcohol awareness also trained in Police statement writing if they have to log any incidents. The Street Marshals are also familiar with other services these include homeless, mental health provisions and service providers for drug and alcohol. To reduce alcohol and related crime and disorder associated with the evening economy of the city centre in question. To promote lines of communication between agencies, businesses and licensed premises with the local night time economy. To improve the perception of safety and thus reduce the fear of crime within the city centre. For the past 2 years 247 Security have been providing professional Street Marshalls for Hull city centre. We are there to help and maintain a safe environment for Hulls night time economy also offering an increase security presence for the Police and Paramedics and Door Staff. The Street Marshals also act as a visual deterrent whilst walking around the city centre which is something you can’t measure. The Street Marshals can be brought in to cover busy times such as Bank Holidays, Sporting Events also late night shopping and Christmas light switch on to offer a further security presence. 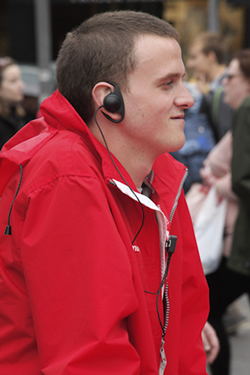 All Street Marshals have a radio link to Hull Civic Radio which operates all of Hull CCTV cameras so if they came upon an incident they can get full back up from the nearest CCTV camera this offers safety to the Street Marshal also gathers evidence if it was required in court for prosecution.